Yucca in Infrared, by Mike Jackobo. 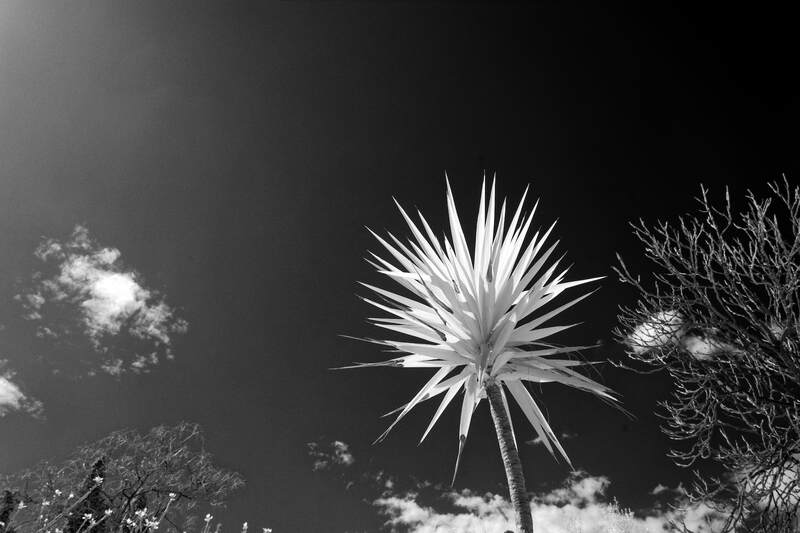 Photograph of a Yucca in Infrared. I made the photo on the same day as the Arch towards the Sun photograph, that I presented a few days ago. I was with a friend and we decided to sit in a cafe, in the middle of the park. In this cafe, there is a garden and the Yucca was at the middle of this garden. The sun was just off the top left corner of the frame. So, similarly to the afformentioned photo, I tried to take advantage of the backlight to make the photo. I went for a minimalist composition, that made the white Yucca in Infrared stand out against the dark sky. The resulting image was impressive enough, so the photo made its way in this post. In a way, I broke my own rule to avoid single trees in infrared… again! This photo though, is not about the infrared effect for the sake of the infrared effect. The theme of the image is the contrast between black and white. This contrast doesn’t exist only between the leaves of the Yucca and the sky. It also exists in the gradient of the sky. The infrared light from the sun can illuminate only so much of the sky. So, there is a sharp cutoff in the gradient, about halfway in the frame. This makes the right half of the sky pure black. This, in itself can be an exercise in the study of light. The placement of the Yucca in the lower part of the frame was deliberate. The lower right quadrant of the frame is one of the strongest portions of an image. That is because the human eye naturally rests on that portion. So, in this particular case, I have the Yucca itself in a position that draws attention. At the same time it is placed where there is strong contrast between its white leaves and the black sky. The devil is in the details. Even a simple photo can hide many elements that make it stand out from a virtual pile of images.